PU Black Leather Jackets - Be Glossy In and Out! Autumn is such a beautiful season that comes between summer and winter. As the weather is colder and unpredictable, we definitely need to wear a stylish jacket. Leather will always be in fashion, so the best choice is a leather jacket. But how you wear it and where to get cheap nice jackets? PU leather jackets cost much less than the authentic ones and they are also an alternative for those pursuing vegan lifestyles. Synthetic or authentic, leather jackets can match many styles. They have been associated with subcultures such as greasers, motorcyclists, military aviators, police, and music subcultures (punks, goths, metalheads, rivetheads), who have worn the garment for protective or fashionable reasons, and occasionally to create a potentially intimidating appearance. But they can be easily worn of any social category, the secret is in the accessories. 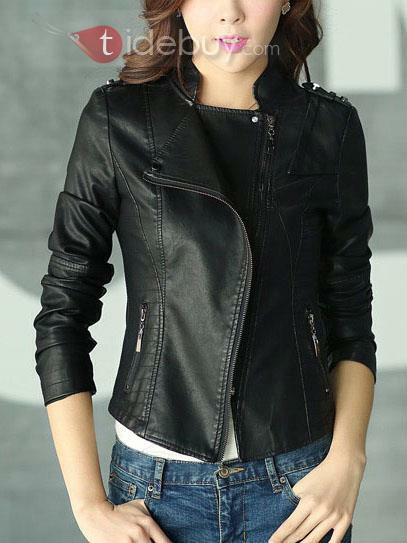 The leather jacket is usually casual, so the best outfits to match with it, are the jeans, black tight pants, or skirts. Here are mainly included the biker jacket or fringed. For a more elegant look, you can add the jacket to a glamorous dress or office pants and over the knee boots or high heels. The most suitable designs for evening looks are tight in the waist and longer jackets. Black and white combination and leather jackets with attached fur are so fashionable this year. Find your Tidebuy jackets online, where you can choose from hundreds of stylish designs. Leather jackets not only keep you warm but give attitude and style to the wearer. You really can't go wrong with a leather jacket. It goes with everything!